It was cold, very cold in the morning. The night had brought more snow on the ground and because of the lay of the land, there was ice on the ground as well. I packed up my stuff at 8am and amidst the ice, snow and cold I set out for China. The customs questions and medical exam were a no-brainer. 1 minute each, the first asking me how I got over the pass the previous day. I told him - he thought I was nuts. The second simply asked me whether I was physically fit. I said yes and he said OK. The immigration part was also easy and then I was let go. The road was icy and I had to be careful. 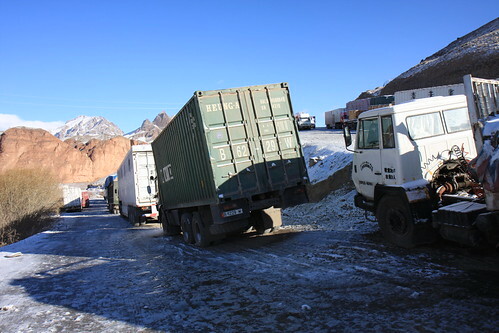 The trucks weren’t moving at all, so I was the first one to reach the first Chinese control post for the day. Here is what it looks like before getting there. Trucks were all over the place, some having skidded to a halt more than anything else. I slipped up the hill more than anything else - the ice didn’t allow for any riding. Then I reached the border post - I was in China!!! The first one is only a control post - people were extremely professional, they radiod me in and after a few minutes I was able to move on. No problems for having gotten the visa in Tashkent. A friendly border guard and I chatted while the adminstrative bureaucracy was milling away … all the while standing in a grandiose landscape. 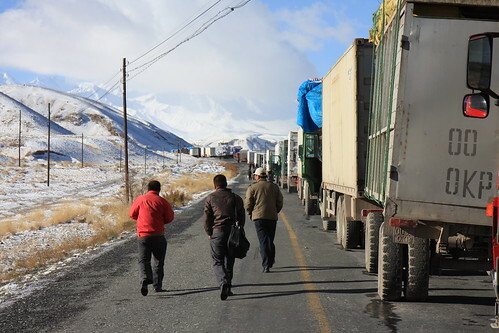 There was a long line of trucks waiting to move into Kyrgyzstan and I am sure they were there for a while longer. 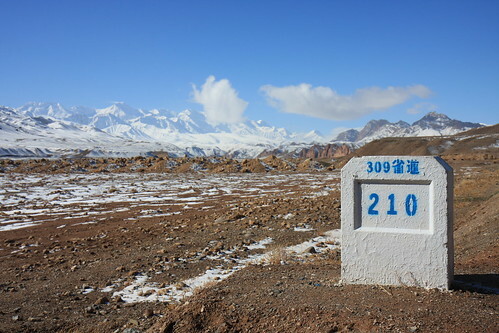 The actual border post is 8km further along - the road was no longer icy thank goodness, it being in the sun now. The truck drivers were heading back to their vehicles. Again, very helpful staff at the border post - I had to wait for a while as things were moving at Beijing time, which is 2 hours up and it was then noon time. Don’t ask why this is … but I moved out as soon as I could and still had to wait. Then I was really in China!!! The rest of the day was a lot of up and down, the snow giving way to greener valleys although I remained at the same altitude for most of the day. There wasn’t much water for most of the day, but thankfully that wasn’t an issue. I am glad to be back on the bike in the end despite the problems I am having with the bike. 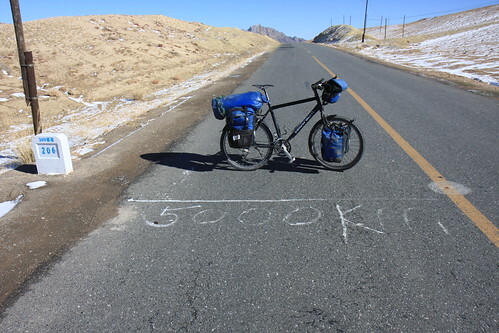 It was in the end a longish day, with lots of altitude (1415m) and lots of km (122km). But it felt good and I felt good despite the long break. I picked a great spot for camping and had to remind myself that I was now in China … which kept putting on a big smirk on my face. The landscape is still grandiose, there are still Kyrgyz felt hats. But the roads are so different. Sealed, in good condition, with lots of signs. The people here honk all the time - slighly annoying, but they do it every time they pass someone it seems. Signs are in Mandarin and Arabic and there is a feeling of strangeness as I can now no longer read anything unless it is written in English. Bad night really - couldn’t sleep too well in the other guesthouse, although the lady was really really sweet. And she was shocked by what had happened. I had made up a plan for the day … wanted to leave as soon as I could, but also wanted to see that things were in order before doing so. It had snowed during the night, the road was clear however. Nevertheless, riding was questionable. I had decided to go back to the house once again to see whether I could get my stuff back. Turned out that the pots were not the only thing that was missing. My water bottles are gone too. Which is inconvenient if nothing else. But that didn’t yield any results. The guy just walked past me when I approached the place. I then turned to the police. This was surreal to the extreme. I had thought that maybe with their help something would turn up. What a mistake. They were completely drunk at 9am on a Sunday. The commander was nothing but a shame on any institution. He kept saying that he wanted to help me but wouldn’t even let me explain things. After I got through to him we drove up to the house, horns blaring because he had had too much to drink. The girl was there and she simply accused me again of not having paid up. The police turned against me briefly. I told them what was missing, the girl saying: “Look around if you can find it.” She was as cold as ice. I had enough. Said goodbye and thank you, when the policeman grabbed me and wouldn’t let me go. Eventually I got rid of him, walked away. Back to the guesthouse I was staying that night … the lady there was a great, great help. 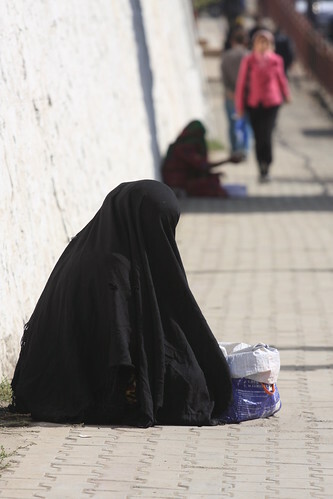 Don’t ever go to the Sary Tash guesthouse when you are there, head to the Leda Hotel. That is all I can say. I tried buying some things … of course, there were no pots to be had anywhere. And without them it would be bad in this kind of temperature. I bought some rope which was no good, but the guesthouse people helped out again. Then I meant to leave after fixing the bike up. Here is a list of things that are missing / damaged. Ultimately, I was lucky I suppose - the damage could have been far worse. I took off at 1pm in the end, but right after taking off I encountered more problems with the gears under load. And it was starting to snow. I ploughed on … decided to take things out on the road and at myself. The road was bad, the snow was driving in from the side, but I made decent progress for some time. At some point it was no longer possible to ride. It was almost complete white-out. The surface became slippery to the point that you couldn’t even push the bike uphill any longer, loose rock all over the place. After 45km I had to give up and tried to stop a truck. 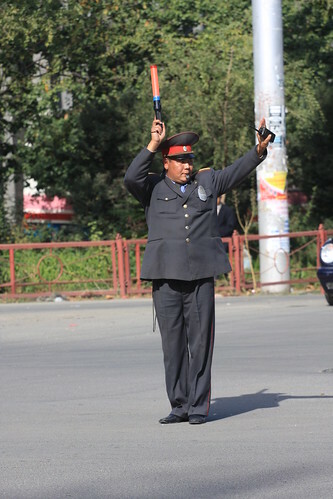 None of the Chinese trucks would stop, but the first Kyrgyz one did. I didn’t feel bad about heading into the truck - this was a rational choice. Pitching a tent in these conditions was out of the question and so waiting it out was a no-go. Just before Nura I got out and continued cycling, passing the town of Nura. It was completely demolished with only a few houses standing. I thought back about how I could have been there had I not gone to Bishkek … had I not gone there I would have had a good bike still, too. But I could have been dead, too. Like 72 other people who had lived in that village. I didn’t want to take any pictures. Do an internet search if you’re interested. I moved on to Irkeshtam - an abominal place. There are very few houses. The rest of the place consists of nothing but trailers. It is all business. By then, it had started to rain / snow again. But I was lucky. The guesthouse I was in had a wonderful family and the way they cared about me was extremely moving. I could cook my own stuff in their kitchen, the two sons moved out of their place for me (I realized this only later) and they invited me for dinner afterwards. 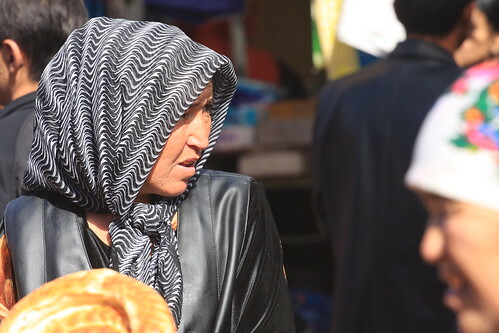 They were extremely kind … and I had a wonderful conversation with their oldest son about his life and what he wants to do … as well as how things are for him in Kyrgyzstan. A similarly awesome conversation followed with three travelers from Israel, ranging from events there as well as a range of other topics. A good day after all … but no pictures. I had hoped to be in Sary Tash by mid-day, but that didn’t work out. Another traveler, Dean, and I headed to the taxi stand and were ultimately there for five hours before taking off. The place was craziness. No one wanted to go it seemed, but to be fair, people only start heading out when the car is full. But the weird thing was that there were people coming and going, all wanting to go to Sary Tash or beyond, but the cab drivers didn’t seem interested to pool them. It was a nerve-wracking experience. We could have taken off at 9 am it seemed, but didn’t until about 1 pm. So much for leaving Sary Tash today to get some mileage in and leave the place. 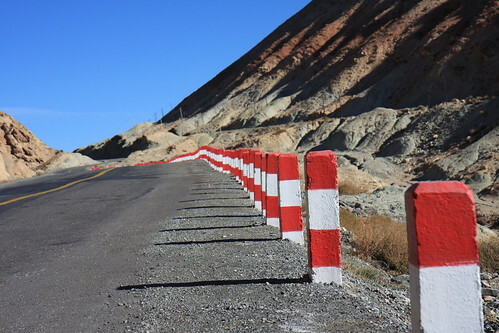 It wouldn’t have happened anyway … when we got to Sary Tash it was dark and it had snowed when we drove over the last pass. The ride itself was grueling, 4 peope on the back bench - the usual thing here - and so the fun was somewhat limited. 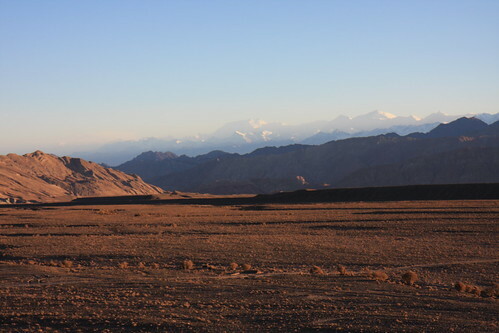 As we were heading to Sary Tash I was looking forward to heading out the following day. Little did I know what would happen over the next hour. Dean and I went to the guesthouse where I had left the bike, a Korean tourist group being there. I wanted to check what was going on with the bike, just to make sure. I asked about the key for the room that we had left the bike in and was told that the son had the key, he would be right back. Fair enough, I thought. 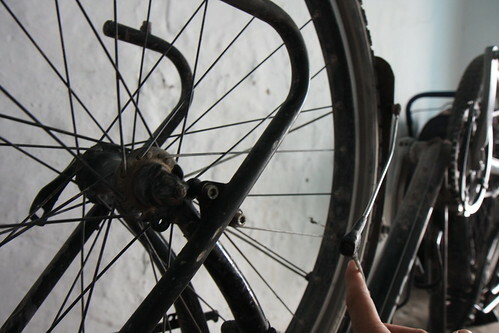 Then, when coming back from the toilet, I saw my bike standing outside, thinking: “What is my bike doing here?” Unsure about things, I checked the bike out and found it damaged. Nothing major - the fender mounting was broken. A nuisance maybe, but I left the bike in the owner’s care. Then I had a look at the bike computer and found that there was a lot more kms on it than when I had left it, to be exact 145km more. Ouch … I was not a happy person. Things became ugly then. I confronted the son - he said that he didn’t know anything. Why was my bike in a different place? The father said that he should put it closer to the house. Not a good answer, things had been locked up before. Everything was fishy … I checked my bags and found that some things had been taken out. The pot bag was missing, including some other items. More confronting … no one seemed to know anything. He pretended as much at least. It was all frustrating and any trust that I had had was violated. The damage didn’t seem substantial, but the fact that the bike had been ridden really riled me. One of the Koreans confirmed that he had seen the son riding the bike. The guy was about 20 and vile. Things got ugly then … he kept demanding money from me, claiming that I hadn’t paid up when I stayed the first night. I had. Then he wanted money for keeping the bicycle, which really annoyed me. He kept pushing a piece of paper under my face while I was going through my stuff to check whether anything else was missing. For some reason, I didn’t blow off steam at this point. There wasn’t any point. For a short time, I felt anger rising inside … thinking back about it (geeky me), Star Wars comes to mind. “Are you going to stay here for the night?” - the answer was clearly no. And I was in no mood to pay anything for leaving the bike. My hunch was that the bike was rented out ultimately. The whole time, the guy was nonchalant and cavalier, with a big grin on his face. His sister just backed him, accusing me of not wanting to pay for the time the bike was in their “care”. I was about to leave when the guy locked me in, saying that he demanded $50, otherwise he wouldn’t let me go. I couldn’t believe the chuzpa. I made as if I called friends to get the police and all of a sudden the door was open. I left rather despondent, figuring that there was more wrong with the bike than I could see at first glance and someone waving a piece of paper into my face. Here is part of the damage - the only one that I saw that night. This will be a one-liner. Nothing happened. Look at these pictures instead. I knew I couldn’t keep my promise. There won’t be updates for the next few days. 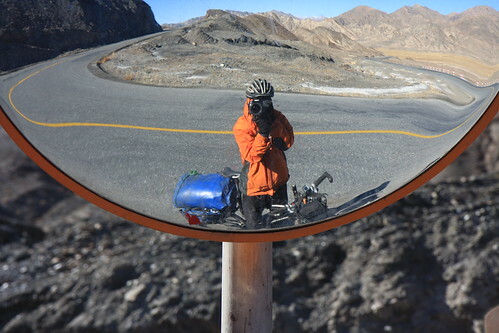 Expect to hear from me once I arrive in Kashgar / China (IF my bike is OK, IF the road is passable and IF I can enter China). All should be fine though, see no reason why any of the IFs should really be a problem. This is it - I am out of Bishkek. Visa in hand, some last things taken care of, I am back in Osh as I am typing this. The usual things here - can’t take money out as no one really cares if an ATM works or not, blank DVDs are a hard find and the like - but then I was finally on my way to the airport again. 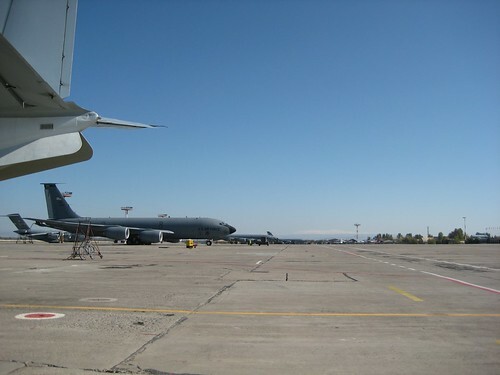 The airport is being used as a military base for operations in / over Afghanistan and adjacent countries, as evidenced by this picture. It was a beautiful day and the flight was great. 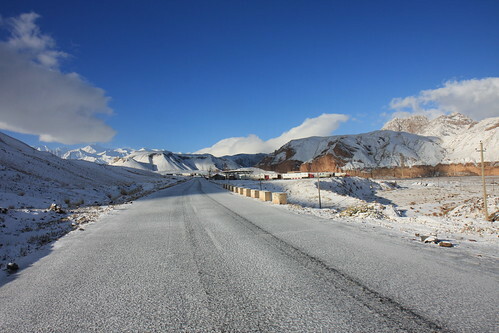 Snow-covered peaks all along the way and then I was back in Osh where I will be staying for a couple of days and then head back to Sary-Tash. The latest news is this: from the pictures of another traveler I am pretty certain that my bike is OK, all the houses in Sary Tash seem to be standing still. However, it has gotten really cold up there and snow has fallen. It has largely melted away, though this could mean that the road heading towards China may be muddy now. We shall see what happens - the fun never stops. And I am not the only one who has taken a plane as of late. Rob over at 14degrees.org is finally back in New Zealand after setting a new record for solo-skateboarding. Makes my journey look like a walk in the park.